The long awaited MGS from AFV Club has finally arrived. Out of all the Stryker variants the M1128 MGS is probably the most unique, in that it resembles a tank, which is probably why many modern armor enthusiasts have been anticipating its release. However, the MGS is not a tank on wheels, it is an infantry support vehicle. Still, it has that big gun, and that is good enough for most of us – it looks cool. The MGS has a crew of three, and is armed with the M68A1E4 105mm main gun with an auto-loader. The gun is the same as used in the original M1 Abrams. Given that the vehicle is used for infantry support, part of the 18 rounds carried are canister rounds. In addition, a coaxial 7.62 MG can be employed, as well as the TC’s M2 .50 cal MG. Having reviewed previously the M1126 ICV and the M1130 CV/TACP from AFV Club, the focus of this review will be on what's new/different to produce their kit of the M1128 MGS. Lower Hull and Wheels: The lower hull is discussed in the first six steps and mirrors the ICV build up through Step five. Step six now gives us a very nice plastic perforated strut guard, which replaces the initial production strut guard provided in the ICV kit, and the PE perforated version provided in the CV kit. The stowage bins between the wheels have been updated in the MGS kit but the old one is still in the box. The old box was made of metal and shaped slightly different. To save weight, General Dynamics came up with a fiberglass stowage bin which we see here. While early Strykers had the metal bin, the MGS only has the fiberglass bin, so be sure to use the one called out in the instructions. In any event, the hinge detail on the new bin is nicer in the MGS kit. The wheels now come with valve covers, and the MGS instructions provide for the use of just two step rings for both front wheels even though the original eight are still on the trees. I have not seen a step ring on the right front wheel of any MGS’s either deployed or at home station; only the left front wheel, so just use the one. I suggest trying to thin the over-scale plastic wheel rims by placing them on a Dremel conical bit and spinning it over some sandpaper. If you get too aggressive and overdo it you have plenty of extras to try again. The unique rear doors are also well done and are best closed up since no interior is provided. Upper Hull: The upper hull is where things begin to change dramatically from the other kits and it is equally well done. The winch opening is covered, as it should be – pre-production vehicles did not have the area covered, but production vehicles did. The water can rack comes in several flat pieces, so the builder may wish to take advantage of this before gluing together and thin the pieces to scale. This rack even comes with PE straps. The wire cutter in front of the driver hatch has the option of either being in the raised position or the folded position. Another nice touch is the second generation DVE next to the driver hatch. Many of the parts from the first two Stryker offerings are still provided like the light clusters and fine PE mesh for the engine and air intake grills. The light clusters should have the prominent wiring added by the modeler since it is very noticeable. The large engine hatch cover is from the original kit and still has the footman loops molded on. These are very well done for plastic and correct for the MGS as well. I have not noticed footman loops on real MGS’s elsewhere, so this may be one item the modeler does not have to add like on the ICV and CV. The front hull comes with a nice tow bar mount seen on all MGS whether or not the tow bar is there, so be sure to use it with a non-slat MGS. The instructions show how to depict the two bar either stowed or in use. An opportunity for the modeler to update the kit would be to add a water can rack to the left side hull above the second wheel. Turret:The MGS gets its futuristic look from its unique turret. The gunner and TC do not reside in the upper part of the turret but are on either side of the main gun. Since the MGS uses an auto-loader the upper turret can therefore be quite narrow from the frontal arc. 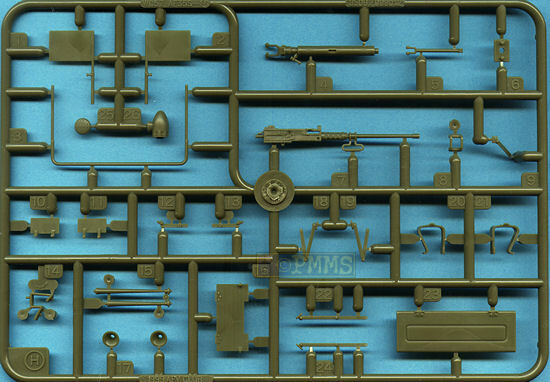 As a result, the MGS turret is a bit complicated in its assembly. The instructions are well thought out and there should be no problems as long as they are followed. The main gun barrel comes in aluminum but has a plastic midsection, including the fume extractor, so seams still need to be dealt with on the gun barrel. The nicest part of the aluminum barrel is that it comes with a partly drilled out and rifled muzzle. Possibly the nicest part of the turret is the commander’s panoramic viewer. AFV Club allows one to position it stowed or extended, and it also allows the head of this part to rotate while all along allowing the complete body to be raised or lowered. An item that can be added for additional detailing is a canvas sun screen seen on deployed vehicles. Another nice touch for the turret are the PE straps for the turret roof of which there are 13. The gunner’s site comes in nine pieces and can be posed open or closed. The two crew hatches for the turret seem fairly complicated and care should be taken here. The periscopes are all different, so this will not be part of the build that gets slapped together. The periscopes need to be colored in the appropriate anti-laser reflective color that most modern armor builders are now aware of. These colors tend to be liken to gold, ruby, or purple. The commander’s .50 cal is the same MG from the ICV and is well done for a plastic version. One of the upgrades that is prominent on deployed MGS’s is the MG shield in front of the Tc’s MG. This is not provided in the kit, but it is okay since many home station vehicles do not have it, and initially deployed MGS’s did not have it. Not only does this upgrade have a shield, but it also has a partial skate rail, so it is not an easy detail added by the modeler without good reference photos, which right now are lacking. One shortcoming of the kit, like the previous two Stryker kits, is that there still is no non-slip texture. On the Stryker it seems to be a bit finer than on other vehicles like the Abrams and Bradley. One may also want to add the large double bead weld seams along the length of the recoil housing behind the gun tube. I also will comment on the Slat armor situation. All deployed Strykers, including the MGS, have slat armor attached. There are several options now available to us for building an ICV or other similar variants with slat armor, but it will not be so easy at this time with the MGS. The MGS slat is somewhat different, especially near the turret, as it bows out to allow clearance for it. So, until the aftermarket folks get access to a slat MGS we may have to wait a bit to model a deployed MGS. Aside from these elements, the kit offered by AFC has excellent crisp detail that is highly accurate and will be welcomed by many. Recommended. Special thanks to Andy Elesky for use of 4 of his photos of the actual MGS which accompany this review. Highs: Excellent, crisp detail. Very accurate. Lows: No non-slip surface texture. No hint at interior. Verdict: This is a superb offering in which the shortcomings are minor. We will need the aftermarket folks to help us with a slat kit to depict deployed MGS's. Copyright ©2019 text by Robert Burik [ BURIK ]. All rights reserved. I got a horn in 1/35th!!!!!!!!!!!!!! It came in the AFV Centurion Shot kit that I reviewed. It is Sprue H. The sprue fit was on says it was from the WC-57 kit. It's part 15 and 17. Picture curtious of PMMS. Thanks John, I look forward to your build review. Thanks for the Review. Looks to be a killer kit. Can't wait for mine to arrive. Only thing I could see was Manufacturer price is $64.95 reason I had to go to Hong Kong to get it my LHS wanted that plus tax. Just got my AF CLUB MGS Stryker. Very nice, great detail, blah, blah blah. It's old. To be expected I suppose. I work for General Dynamics as a tech on these things so I am privy to changes that may or may not come out on the models. The most noticable major change that is not present on this kit is the .50 cal set up. It now has a completely different mount and a small arms shield has been added. There are numerous other small changes implemented in the past few years, cooling fans for FCU's, changes to CREW kit jammers, etc, I wonder if aftermarket kits will be available for this. Like the slat armour kits. We'll see I guess.